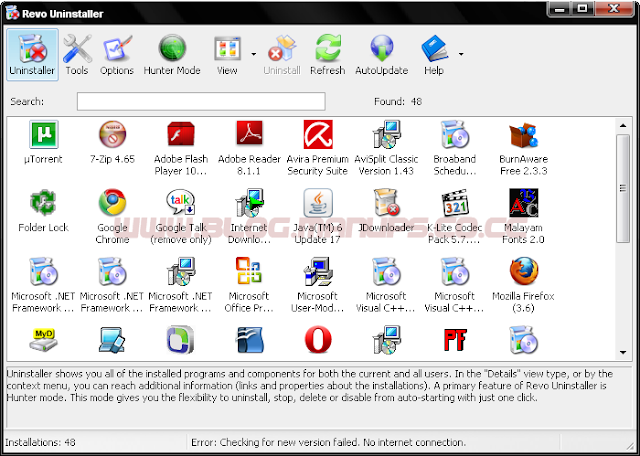 Revo Uninstaller is a freeware innovative uninstall utility much faster than Windows Add/Remove applet.Where the built-in and sluggish Windows Add or Remove Programs option fails, freeware Revo picks up the slack. It builds out a useful feature set on top of a fairly light, 1.5MB installation. Launching Revo fires up the Uninstaller screen, which shows icons and titles of all programs installed on your machine. You can change the View to List or Details, if you'd like more information. Right-clicking gives users a list of choices, from the fundamental like Uninstall and Remove from list, to Search Google, Show the installation directory, and quick access to the app's Help file, its About screen, and an Update link. Revo also provides some powerful tools. Advanced mode adds program-specific Registry key access to the context menu. The Tools Optimizer holds the Autorun Manager, Windows Tools access screen, and a Junk File finder/killer. The Autorun Manager provides one-stop shopping for startup tweaking. Windows Tools pulls together various and disparate basic utilities under one umbrella, and the Junk killer is just killer. The Tools Tracks Cleaner accesses cache-cleaning features, include standard browser cache functions as well as crash memory dump files, MS Office cleaners, system-wide and program-specific search histories, and more. Another cool function is the Hunter, which offers click-and-drag uninstall and process-killing functionality.